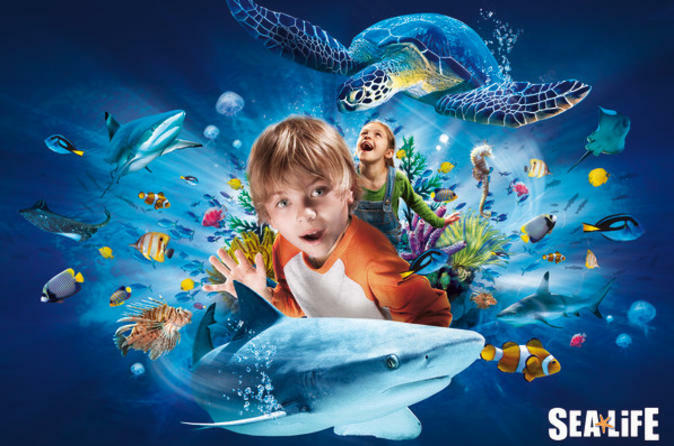 Dive into a world of more than 5,000 sea creatures at SEA LIFE Aquarium Dallas, where you can spy seahorses, clown fish, sharks and sea turtles, among other underwater critters in 30 display tanks. You get to decide how to spend your time in this watery wonderland. Want to check out the stingrays? Stand on a platform overlooking the Bay of Rays to get a great view of the rays gliding below you. Afterward enter an underwater tunnel that goes through a tank to marvel at the sharks and fish as they swim around you! You can also see a variety of colorful jellyfish pulse and watch the sea turtles cruise about. For a close encounter, visit the interactive rock pool display where you can see a sea star, sea urchin, shark pup or horseshoe crab. Young children will love watching the fascinating sea creatures and educational displays right at eye level. For more learning opportunities, join the friendly and knowledgeable staff at SEA LIFE Aquarium Dallas at educational talks and feeding demonstrations throughout the day. Watch the sharks and rays eat as you hear facts about their habits and threats to their survival. On the behind-the-scenes tour, you’ll get to see the aquarium’s laboratory, animal health and food-prep areas. You can also learn about SEA LIFE’s rescue and conservation efforts; some of the creatures you’ll meet were brought to the aquarium after they were found injured in the wild. Special Offer - Price displayed includes a 14% discount off the local admission price! - Book Now!